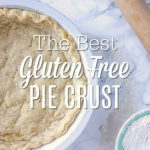 The best gluten free pie crust has an irresistible buttery and flaky crust, perfect for savory and sweet pies. This all butter, gluten free pie crust recipe is a basic staple that can be used in your favorite pie dishes. 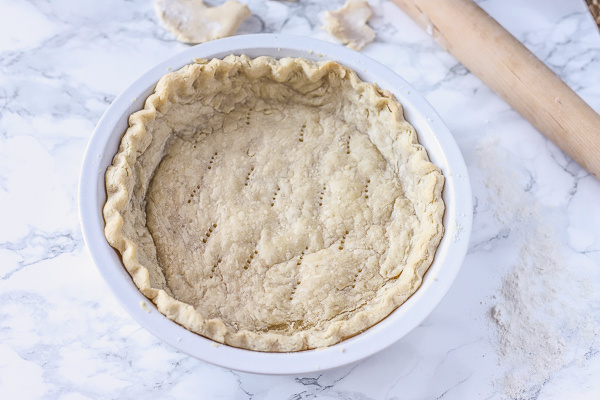 Follow my step-by-step instructions below and tips on making the perfect pie crust. For this recipe you will need: gluten free one-for-one flour, egg, ice water, one stick of butter, salt, and sugar (if making a sweet pie crust). Since the holidays are literally right around the corner, I thought it would be the perfect time to share this pie crust. Confession: this recipe has been on the blog multiple times, from tomato pie to blueberry pie, but it never had its own formal introduction. Friends, meet my absolute favorite gluten free pie crust; pie crust, meet my friends. This buttery and flaky crust is irresistible. It’s crispy, and did I mention buttery? It may not be the main part of a pie recipe, but secretly, it is my favorite part. This pie crust steals the show. Which is kind of funny, because I used to always eat around the crust, only eating the pie filling on sweet pies. But that may be because a lot of store bought pie crust is gross. Yep, I said it. Soggy, flavorless crust doesn’t help pie. This crust has redeemed my dislike for pie crust, and I think it will for you, too. Making pie dough from scratch seems really daunting, but trust me, this is easy. And if you have a food processor, it is even easier. Below, I outline step-by-step with pictures just how to make this quick pie crust. 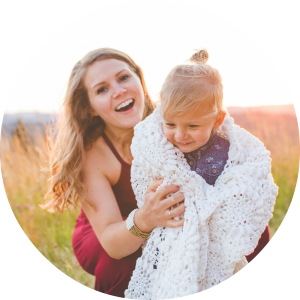 If you follow me on Instagram, you may have heard about us getting our 3-year-old daughter tested for celiac disease. It was a very long 6 weeks of stomach issues, only to be told she was not celiac. Which, don’t get me wrong, is fantastic, but the day we switched her back to a gluten free diet, many of her symptoms disappeared. Then the other day, my husband took her to a restaurant with his parents. He left the table for a second, and by the time he came back, she had goldfish in her hand, happily munching away. She only ended up eating a few. He forgot to mention this to me, and when I took her to the bathroom the next day, I could tell something wasn’t right. So I asked him what they ate at the restaurant, and he told me the story. She had like, 4 goldfish, and you could instantly tell. All this to say that even though she doesn’t have celiac, she is still gluten-sensitive, and we have to be extra careful to stick to a gluten free diet. You can also read here why we are mostly gluten free. Hence gluten free pie crust! Use really cold butter and water. I like to chop the butter into small cubes and place into the freezer for 5-10 minutes before making the dough. Add one tablespoon of ice water at a time to ensure the dough becomes the perfect consistency. Don’t over mix. It will leave you with a tough crust rather than a flaky one. If you want to make a sweet pie crust, add 2 Tbs sugar. Roll out the dough when it is still cold. If it starts to get too warm, it makes it difficult to work with, so you can pop it back into the fridge for a few minutes and try to roll it out again. Don’t worry if your dough breaks or is too thin in one spot or another. Just use some of the extra pie dough to fill in those spots and press them in. Can an you make this crust vegan? I’m going to have to say no, because the egg is a binder and I don’t think using a egg substitute (like a chia, flax seed egg or an actual egg substitute) would work well. If you try it and it works, let me know! Probably. Now, while I’m a butter fan and don’t like using margarine, if you are strictly dairy free and need a substitute, a dairy free substitute like earth balance sticks (not the spreadable kind) should work fine. Coconut oil would probably not work. Do you need a food processor to make this pie dough? No, you could definitely make it by hand with a fork or pastry blender. It is just way easier to make it with a food processor. Do I need to blind bake this gluten free pie crust? Should you? Maybe. Do I? Nope. This pie crust tastes the same whether you blind bake it or not, so I just skip this step. Pie perfectionists are probably dying a little inside right now. Would it be prettier blind baking it with pie weights or beans? Yes, yes it would. The point of blind baking pie crust with parchment paper and weights or dried beans, is to keep the pie crust pretty and upright. The steam that forms while cooking can cause pockets to form and can make the sides sag…as they are a bit in my pictures. Honestly, I have better things to worry about or maybe pies are just one thing I’m not type A about. So that decision is up to you. You can read about it more here. Need more gluten free desserts? Check out some of our favorites! Follow these step by step instructions with pictures to make the perfect gluten pie crust. 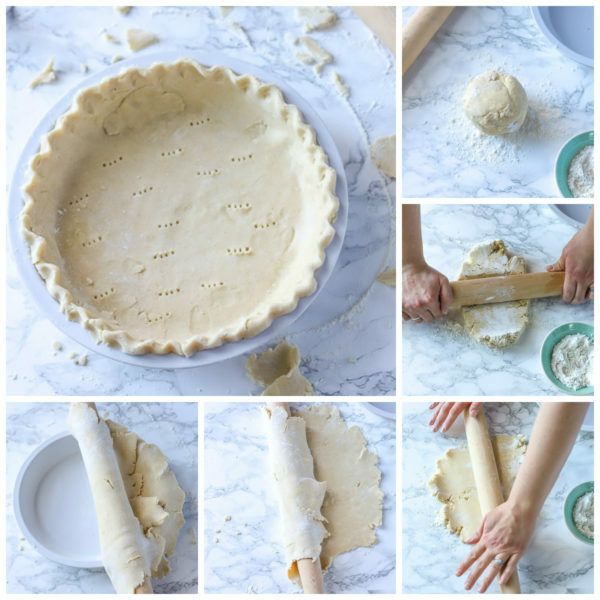 Tools you may need to make pie dough: food processor, rolling pin, pie plate, plastic wrap, knife, and a fork. Chop butter into small cubes and place in the freezer for 5-10 minutes. Since we don’t have ice at our house, I place a small amount of water in a dish and place in the freezer for 5-10 minutes. 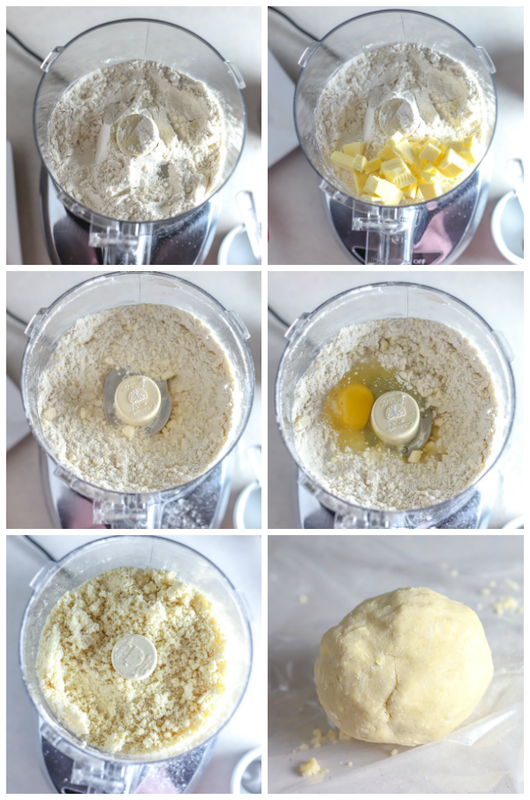 In a food processor, add gluten free flour (I use Bob’s Redmill One to One), salt, and butter cubes. Add in sugar here if you are making a sweet crust. Pulse until butter turns into small crumbles pea sized or less. Add in egg and one table spoon of ice water. Pulse a few times just until it all comes together. Scrape down sides and check consistency. Dough should come together and form when pressed together. If it is still too crumbly add another tablespoon of ice water and pulse a few times. Check consistency again. Usually it takes about 2 tablespoons of water. But if you use a different gluten free flour, it may take more or less water. Be careful not to over process it. Take it slow. Place pie dough on to plastic wrap or your counter, roll into a ball and wrap. Stick in the fridge for at least 10-30 minutes before using. Can be made days in advance, or you could stick it in the freezer for up to a month; just take it out and place in the fridge at least 5 hours or more before you are planning to use it. Preheat oven to 350. Roll out pie dough on a cleaned and floured (with gluten free flour of course) counter. Try to work it the least amount possible . I like to roll it one direction, turn it a quarter turn, roll it the same direction, and just keep turning it until a circle is made. *If it starts to get too hard to roll out and just seems to be falling apart, it may have gotten too warm. Place the dough back in the fridge for 10 minutes and try again. Fold dough over rolling pin to easily move to pie place. Lay dough over pie plate and gently move it into place. Cut off extra pie dough and shape dough around the edges with finger or press with a fork. Poke holes in dough with fork in the bottom on the pie plate. Pre-bake pie crust for 15-20 minutes. If you are super awesome, you could blind bake it with parchment paper and beans or pie weights, but usually I don’t do this. Fill you gluten free pie crust with with your favorite pie filling and bake according to instructions. This easy, no fuss gluten free pie crust is a simple staple that everyone will love. The buttery and flaky crust may just steal the show for your favorite pie recipes. Buttery and flaky gluten free pie crust is amazing and will quickly become a household staple recipe. Preheat oven to 350. Roll out dough to about 1/8 inch thick and place into a pie pan. Cut off excess dough, and form with fingers or with fork. Pre-bake for about 20 minutes before filling. Use very cold butter. Place in freezer 5-10 minutes before using. You can make this ahead of time and keep it in the fridge for a few days, or freeze it for a few weeks. Have you you ever made pie crust before? Thank you for the detailed step by step – pie making can be so daunting and most of that stems on the fussiness of the crust! This looks great! 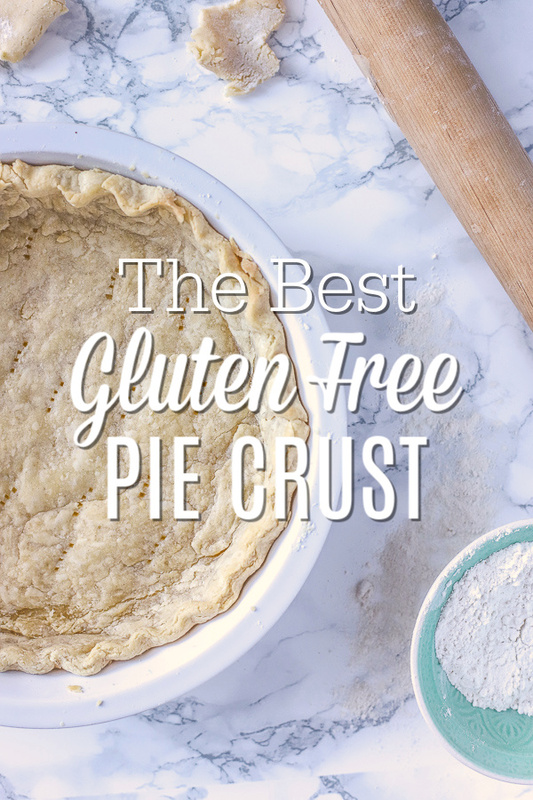 pie crust is always so tricky to get just right…especially gluten free! Nailed it! Thank you! It may not be the prettiest thing, but it is soooo delicious. Always on the lookout for a good gf pie crust. This looks great. Thank you Mary. Hope you enjoy. What a gorgeous crust! I bet it’s delicious with all that butter… haha! Thank you! You betcha hahah. Butter makes everything better! This looks like the classic ratio of ingredients my husband’s aunt taught me when I joined their family, only the gf version! I love how simple it is, and turns out perfectly! Thanks for sharing such a classic gluten-free recipe. Pinning!